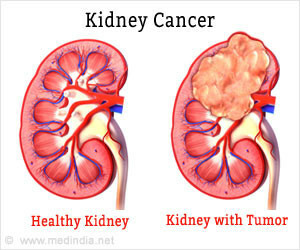 Kidney (or renal) cancer is cancer of the kidneys. Kidney cancer is the 7th most common cancer in the UK (excluding non melanoma skin cancer) and around 12,500 kidney cancers were diagnosed in the UK in 2014. It is more common in men than women. The type of kidney cancer depends on the type of cell the cancer started in. Renal cell cancer is the most common type of kidney cancer in adults with more than 80% of kidney cancers are this type diagnosed in the UK. There are three main types of renal cell cancer; clear cell (75%), papillary (10%) and chromophobe (5%). Rarer types of renal cell cancer include carcinoma of the collecting ducts and renal medullary carcinoma.Around 7 to 8% of kidney cancers diagnosed in the UK are transitional cell cancers (TCCs) of the renal pelvis (central area of the kidney where urine collects before it goes down the ureter to the bladder. Wilms' tumour is a tumour that can affect children and is different from kidney cancer in adults (this will not be discussed on this page). Treatment depends on the stage and type of kidney cancers. Some small kidney cancers may not need treatment straight away. Surgery is the main treatment for kidney cancer that hasn't spread to another part of the body. Other treatments include cryotherapy (freezing the cancer, radio wave treatment (RFA), radiotherapy and arterial embolisation (blocking the cancer's blood supply). For kidney cancer that has spread, the main treatment for this is biological therapy. Survival depends on many different factors. Generally, for people diagnosed with kidney cancer in England and Wales, more than 70% will survive their cancer for 1 year or more, almost 60% will survive their cancer for 5 years or more and about 50% survive their cancer for 10 years or more after diagnosis. Research on renal cancers and the clinical service offered to patients is increasing, and it is now a major theme for the Cambridge Cancer Centre. The Centre offers a full range of clinical services for patients and, wherever possible, offers opportunities to patients to take part in clinical research. We maintain a highly active clinical trials portfolio, recruiting around a third of patients into clinical trials. The centre runs internationally recognised programmes in the genetics of the disease and the metabolic consequences of those genetic abnormalities, in understanding tumour biology and in the treatment of resulting malignancies. Clinical trials in renal cancer are assessing the development of tyrosine kinase inhibitors as therapeutic agents. The table below lists the current open trials for liver cancer coordinated by the Cambridge Cancer Trials Centre (last updated February 2018). If you would like further information about how to take part in any of the clinical trials listed here, please talk to your cancer specialist as patients usually need to be referred by their doctor.